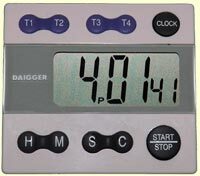 The four channel timer is a stop watch, alarm and clock, all in one and all can be used simultaneously and independently. The pocket size, large face digital timer is ideal for running multiple tasks at the same time. The sturdily constructed instrument optically measure specific gravity of aquous solutions. The handheld unit is portable and easy to read under normal room light. An adjustable focus and a zero adjustment screw make reading and calibration easy. It takes only two drops of sample and results in seconds. The Automatic Temperature Compensation (ATC) mechanism automatically adjust the readings for temperature variations of the solution. The unit is ideal for measuring the specific gravity of bicarbonate solutions used in hemodialysis.